JEPARA - Jepara Regency again won the Adipura Cup award by the Ministry of Environment and Forestry. 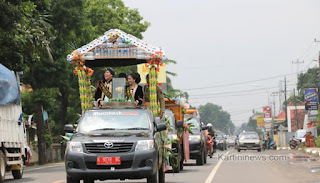 The arrival of the trophy was greeted by hundreds of Jepara residents, on the Demak-Jepara border, or Gedangan Village, Welahan Subdistrict, Tuesday (1/15) afternoon. The cleanest district award, then raced around Jepara to Pendapa Jepara Kartini for a welcoming event. The Adipura Cup is placed in a special vehicle in the front row. After that, there is the icon of the Waste Transportation Information System (Si-Angsa), which is a new innovation in the City of Carving. The janitor, the Jeep car community, and a group of red plate motorbikes, representatives of each regional apparatus who took part in guarding the trophy, looked so enthusiastic. They welcomed the award, which was awarded the 15th time in Jepara District, and 14th in a row. Jepara Regent Ahmad Marzuqi thanked all elements of the community, especially the cleaning staff who were judged to be very hard-fought, to clean and maintain Jepara District always clean. "So that the government's appreciation related to your struggle, you will be given financial souvenirs. "The amount is Rp. 350 thousand without tax deductions," said the regent. Furthermore, said Ahmad Marzuqi, there were four indicators of Jepara Regency to get the Adipura award. Namely, cities must be clean, cities must be shady, cities must be healthy, and good Final Disposal Sites (TPA). The Regent also hopes that the cleanliness fighters or Adipura heroes. Ranging from policy makers to road sweepers and the environment, to further improve their performance. He won the Adipura award, according to the Chairman of the Jepara Junarso DPRD, this is precisely the motivation to reach Adipura Kencana in the coming year. For this reason, the regional government is expected to be able to encourage the community, to play an active role, mainly by forming an independent waste management group that establishes a waste bank. "Waste banks have a very large role in managing in Jepara Regency," he said. Even though the budget for 2019, for hygiene budgets slightly increased compared to last year. Namely from Rp. 2.8 billion to Rp. 2.9 billion this year. Likewise for the management of landfill, this year it rose from Rp 1.3 billion to Rp 1.4 billion. Juarso hopes that the regional government can maximize the cleanliness management in Jepara Regency.